How to create a self-signed SSL certificate for Exchange 2003/2007/2010/2013 on Windows Server - Let the Good Times Roll ! I’ve recently tried a number of GroupWare platforms (among others: Zimbra Open Source Edition and of course Microsoft Exchange) to integrate Vircom’s Anti Spam Software, modusGate. I’ve been a long time adopter of Linux (in particular Ubuntu, or Red Hat before) for servers so I was very familiar with openssl and the creation of certificate requests, local certificate authorities and self-signed certificates. But creating a self-signed certificate for Exchange 2003-2007-2010-2013 on Windows? No idea! It ended up to be pretty easy actually but I still spent way too many hours figuring it out. Hopefully, this article will guide you in the process to avoid you waste as much time as I did. My test environment was similar to that of many organisations: the mail/groupware server is part of a LAN domain (MyNetwork) and subnet (/24), has an NetBios name (WellsFargo), a fully qualified internal hostname (wellsfargo.mynetwork.local) and a fully qualified hostname for public and external use (webmail.mycompany.com). I won’t get into the basics of managing multiple domains (internal/external) and assume you are familiar with the situation. Here is a step-by-step guide and how to create your own self-signed certificate (for free) using Windows (I used 2003 but this should work on 2008 as well) and Exchange 2003-2007-2010. You will now have a new Certificate Request that has been saved in the CSR file “C:\\certrequest_wellsfargo.csr”. A new Get-ExchangeCertificate cmdlet command will show the new list of cerficates, which includes the new certificate request. At this point, the CSR has not been certified, so it can be used. NOTE: There are many other ways to create a Certificate Request on Windows and IIS but I would highly recommend this method as this is the only one I could find that lets you specify a list of alternate domain names (which is a requirement for multiple organisations running internal/private and external/public networks in parallel). (4) In order to perform the signing of the CSR, you will need to install Microsoft’s Certificate Services on your machine. 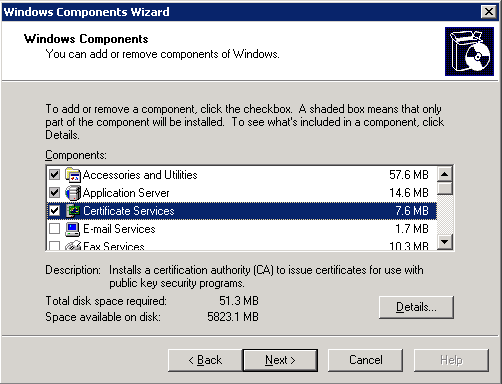 To do so, open the Control Panel, go to Add/Remove Windows Components and make sure that “Certificate Services” is checked. Windows will ask you if you want to install ASP. Hit “Yes” as it is required. The next screen will prompt you for the type of CA you want to setup. Select “Enterprise root CA” and click “Next”. Click “Next”. The following screens lets you customize database and logs path, leave as default and hit “Next” again, and let Windows install the necessary components. (5) We will now login to the Microsoft Certificate Server. Open up an Internet Explorer browser window (as I found out the MS Cert Server doesn’t fully support FireFox and I suppose, neither Chrome) and type this URL: “http://wellsfargo.mynetwork.local/certsrv” or, if your server is only configured to support SSL as is the default for a dedicated Exchange machine, “https://wellsfargo.mynetwork.local/certsrv”. You will be asked for your Domain credentials, enter them. (6) Click the “Request a certificate” link and on the next screen click “advanced certificate request”. 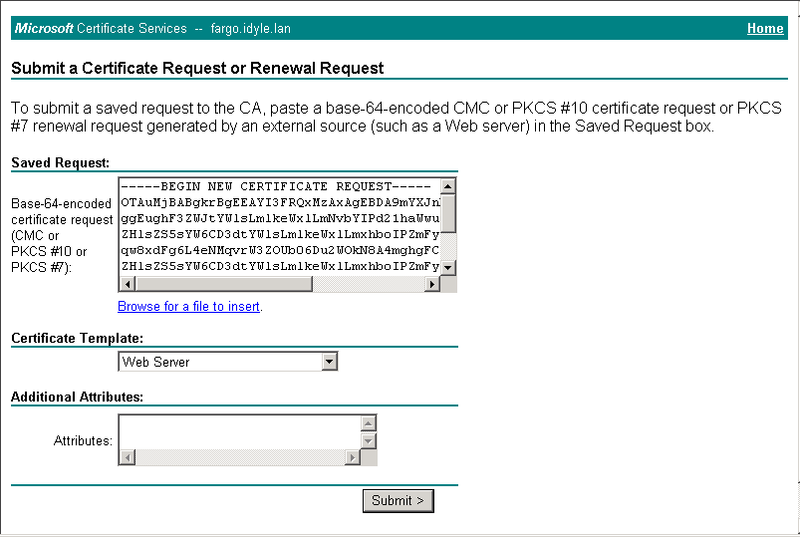 In the Advanced Certificate Request page, click the “Submit a certificate request by using a base-64-encoded CMC or PKCS #10 file, or submit a renewal request by using a base-64-encoded PKCS #7 file.” option. 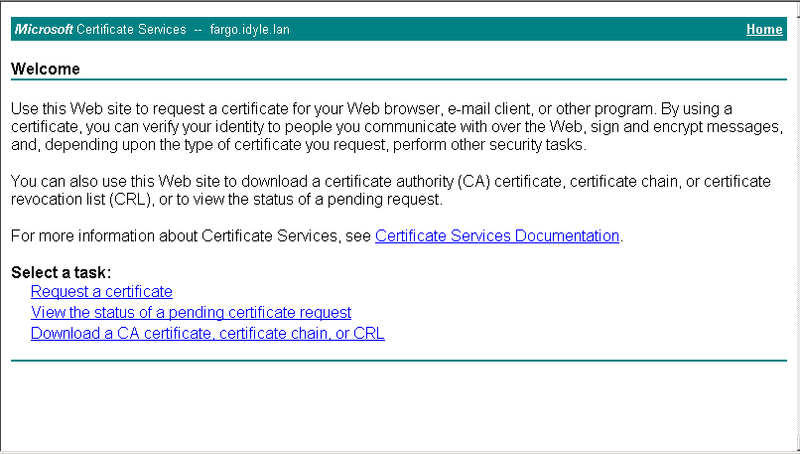 (8) Paste the complete certificate request into the “Saved Request:” box of the Microsoft Certifcate Services web page. Select “Web Server” for the “Certificate Template” and click “Submit”. The newly certificate is the one we registered the request for using the public hostname (webmail.mycompany.com). The other new certificate is the certificate for the CA we installed through Microsoft Certificate Services. (12) The last step is about enabling the new certificate for all services we want to use. In our case, I will enable it for IIS (https), POP, IMAP and SMTP. You’re now all done. Your internal “https://wellsfargo.mynetwork.local” and your external “https://webmail.mycompany.com” will both be valid certificates which will let your clients connect through Outlook, through Outlook Web Access (OWA) and through Outlook Anywhere (RPC over HTTPS) for mobile devices. As noted earlier, browsers will still issue a warning that the certificate was signed by a recognized Certificate Authority (CA) such as Verisign or Thawte. You can override this warning by manually importing both the Webmail CER (certselfsign_wellsfargo.cer) and the CA certificate into all your client computers. On Linux, I used to create and sign my certificate so they are valid for a couple years, in order to avoid having to recreate them periodically. This is something that I wasn’t able to do with this process. During the self-signed certificate creation, I never saw any option to specify an expiration date (or a duration). Does anyone know how ?